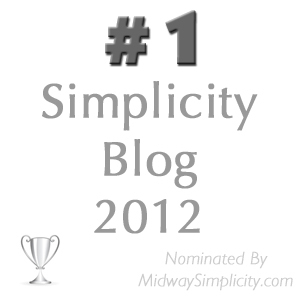 I recently did an interview on simplicity with Mohamed Tohami for his blog Midway Simplicity. I really enjoy what Mohamed writes about at his blog and he seem to me to be a genuinely nice fellow as well. You can read more about his goal for Midway Simplicity here. Mohamed is also the bestselling author of The Pharaohs Code (Creating a Joyful Life and a Lasting Legacy). Without further adieu here it is the interview. Saturday ~ Spy and declutter something soft. Sunday ~ Spy and declutter something made of fabric. Simple Saturday ~ Aussie Video Here is an Aussie decluttering video for you to enjoy. Today's Mini Mission Declutter single use gadgets that you really don’t have a single use for. you are part of a community here and I am glad to have you. Although I am not so sure I am managing to keep up with all the comments lately but some days I have to draw a line somewhere. I do my best. This is good. It’s nice that you are given opportunities like this. I enjoy it too but I hate watching and hearing myself back after I do interviews. Thanks Ideealistin, you are too kind. Wow ! Because I wanted to tell you that last night I had a dream that “they” wanted to make a TV show about you Colleen ! And this morning here you are on my lap top screen ! Good on you ! I really enjoyed the interview. It’s great to put a face to a name, or is that put a voice to a face? Thank you Becky. I think it is both. And yes 365 is definitely a community of like minded people finding a new way to live life with the idea that less is more. I agree, Becky. You have made a great community here Colleen, and it feels very welcoming indeed! Thank you Elspeth, although I think I may have got you all here but the readers have formed the community without much help from me. Thank you Donna but as for my grammar yes you are right and that is all I have to say about that because it is a very old subject that I am tired of rehashing. Loved the interview, Colleen. I thought you sounded terrific. It is okay if you didn’t think so. What struck me today as I listened was your original idea of decluttering without the whole house having to be inconvenienced. While life continues we are quietly decluttering and no one notices….until we tell them of course because we are so excited at our progress. (Tonight while home alone I cleaned out a burgeoning folder of recipes that I have been collecting for over 25 years and threw most of them away! You can be sure that I announced it to the whole family, I was that proud.) Thanks for keeping us focused, little by little we are winning the battle. I do really think it is quite amazing how you comment so much. You do a fabulous job. Hello Grace and welcome to 365 Less Things and thank you for your support. We are agreed, decluttering doesn’t have to inconvenience the household it can be done quietly and efficiently without any fuss and mess. But I must say I understand you announcing your recipe decluttering to the family and feeling pleased with your efforts. Every little victory on clutter adds up to winning the battle so why not celebrate a little after each effort. Good for you. maybe I am just in a very feminist mood this week but I think we all should “brag” more! Talking about it can be such a good thing. Just because many women do many things like they were no big deal (and actually organize everything in a way that this approach works out) doesn’t mean they should not get credit for it!! I think especially with something as “invisible” as decluttering bit by bit, day by day without disrupting everything we need to talk about it. Having a wonderful peer group here is great and encouraging. Having a simplified life is a super reward. But I also want the ones around me to notice the impact. How else could I get them on board to either declutter themselves or at least not give me clutter gifts? It’s not that I am talking about decluttering all the time and everywhere but I rather speak up too often than too seldomly. And male readers: no offense, please. I know not everybody is the same. But I notice women doing jobs without talking about it so often and then not getting credit for it while men make much ado about things that I think at least a little less modesty would be good for us women. *gleeful hug* It’s been a treat watching this site grow! Ditto to what Lynn said!!! What fun it was for me to hear your voice and see your wonderful smile! It was great to hear Mohamed introduce you as a ‘pioneer’ of simplicity!!! Thanks Annabelle, I think that one day I should video the post so it feels like I am talking to you all in person. The trouble is I would play it back and want to rerecord it over and over again until I got it right. Perhaps I could give you a guided tour of my uncluttered, tidy cupboards. I bet that would make me think twice about what is in them and declutter even more. Colleen, I want to say thank you for the time and effort you put in this blog. It really feels like meeting up with friends and that’s of course because you take the effort to reply to almost every comment, post daily and take up reader’s ideas and questions. That said, don’t worry, if you sometimes don’t find the time to answer everyone individually – I think all of us understand that coming up with new blog entries every day AND answering to sometimes more than 80 comments is a daunting task. Please feel free to give yourself a break from time to time – I certainly hope this blog will always be a fun thing for you as well and won’t turn into hard work. Hi Sanna and thank you for your kind words. You are quite correct I can’t be expected to keep up with all comments and I am learning to let go a little. If my readers are responding to each other I sometimes follow the tread and read what they have to say but some days I just have to let it go because I have enough to keep up with. It is great that the readers are now chatting among themselves so much and helping one another. Having more than just my perspective on any topic is a healthy thing after all I am really on one of you I am not an expert on the subject. Quite often the readers glean ah ha moments from each other that they didn’t find in the post itself and I think that is great. Thank you to you all for creating a community here that relies on each other and not just Cindy and myself. I get lots of great ideas from each and every one of you so you could say it is a symbiotic relationship. That is what keeps it fun. exactly. it feels like we all are the collection of our experiences and tips and that ends up as the WISDOM of decluttering. We can just read a bit, pop a question, get an answer, use a tip and everyone is learning from each other. I love it. Yes Colleen – Ditto to what Sanna said!!! forgot to mention, love both of your accents!